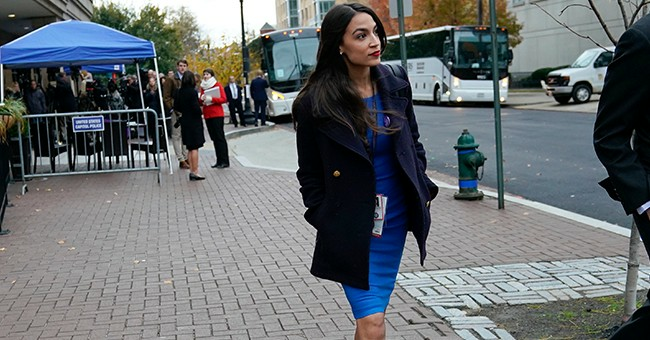 On Saturday, January 19, 2018 New York Democratic Rep. Alexandria Ocasio-Cortez attended the Women's March in Washington, DC despite the group's association with anti-semitism. The Democratic National Committee and numerous colleagues recently disavowed and dropped partnership with the Women's March due to bigoted comments amongst its national leaders. Rep. Ocasio-Cortez was asked about this yesterday and shifted the blame of anti-semitism to President Donald Trump and his current administration while refusing to answer the question. As Townhall's Lauretta Brown previously reported, "The Democratic National Committee...joined a long list of Democratic groups disassociating themselves from the Woman’s March Tuesday following the repeated failures from the organization’s leadership to disavow ties with anti-Semitic leader Louis Farrakhan." The move was prompted after Women's March co-chair Tamika Mallory called noted bigot Farrakhan the "GOAT" or "greatest of all time." On ABC's "The View" Mallory then refused to condemn his numerous hateful statements such as saying he was "anti-termite" when referring to his feelings towards the Jewish people. When asked about these hateful comments, Rep. Ocasio-Cortez said that America needed to "center this conversation. I think that concerns of anti-semitism with this current administration and the White House are absolutely valid." "We need to make sure that we are protecting the Jewish community and all who feel vulnerable in this moment," she added. "...it's so important to recognize why all these women are coming together...to make sure the rights of all women are protected and advanced. And so I know in my heart that all of the New Yorkers that are coming down here and downtown are coming in that spirit and not in the other spirit." Q: What would you say to ppl who have concerns about anti-Semitism in the Women’s March? At yesterday's march in DC, Mallory addressed the crowd and specifically had a message for Jewish women. "To my Jewish sisters, do not let anyone tell you who I am. I see all of you," the Women's March co-chair told the audience.